I often play Board games with friends who do not necessarily have their own Board games library, and a result I often found myself searching for which games to bring each time. A few of these titles are games that I personally enjoy, but which we don’t necessarily play often as a family (otherwise, they would be on the easier to access book shelf where the other games are stored). A few others are filler games which take little space but well occupy an evening. Often, we will decide in advance which game(s) we will play, such as 7 Wonders and Five Tribes one particular Saturday afternoon of August, but I will still bring the bag in case we change our mind in the mean time. In all honesty, the first time the bag was made was on January 1st 2015, when my family and I were invited at our friend Sauveur’s new years party in the afternoon to play games with then unknown number of people of varying age, interest in board games and patience. The bag then was very different than it is today thanks to new acquisitions, but many of the original games haven’t left the bag since then (like No Thanks and Star Fluxx). Entropy, Kickstarter edition with my name in the credits! 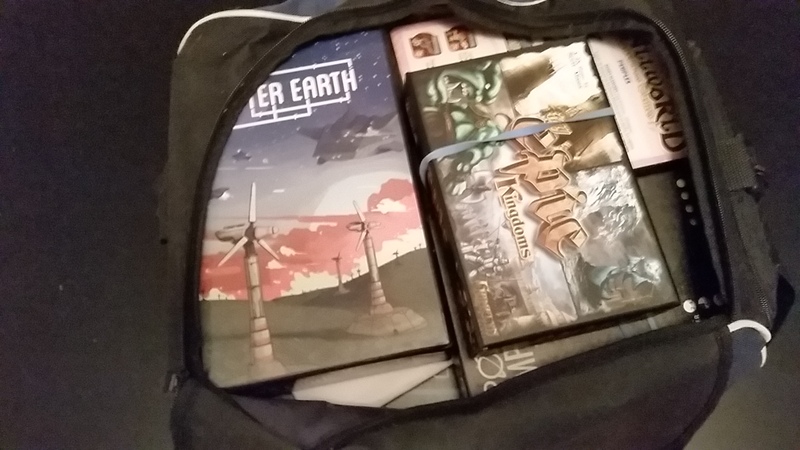 That’s a lot of games in a small bag, but it all (tightly) fits. The last additions, Entropy, Race for the Galaxy, Pocket Imperium and Outer Earth displaced the bigger Splendor box from the bag. As I create pages for the unlinked games, I will update this article, same thing when games are added and removed from the bag.